From left: Janette Holman, Kim Floam, Thomas Reymer, Mitzy Deanda and Eddy Bonilla. On Nov. 23-24, the Incline Highlander Battalion hosted the 18th annual Turkey Shoot, a dundraiser for the IHS Air Rifle Marksmanship. At this event, participants shot for a chance to win a turkey. The winners of this year’s event were Eddy Bonilla, Kim Floam, Mitzy Deanda, Janette Holman and Thomas Reymer. The Highlander Battalion raised a total of $459 at the Turkey Shoot, all of which went toward the IHS varsity rifle team. 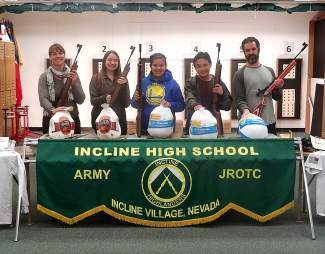 The Highlanders would like to thank Eric Halstead from the Village Meat Market for donating the turkeys to this event as he does every year, and all of the Incline High School students, teachers and Incline Village community members who came to shoot it out at this event. The Incline JROTC also once again had a great year at this year’s Veterans Day Parade in Virginia City on Tuesday, Nov. 11. Having 43 of the Incline JROTC cadets attend the Veterans Day parade was a complete success. First Sgt. Larry Porter led his cadets down the streets of Virginia City, proudly marching and showing our respects for our fellow veterans. The crowd was very large, with up to 600 people attending this year’s parade supporting and honoring the veterans who have served our country. 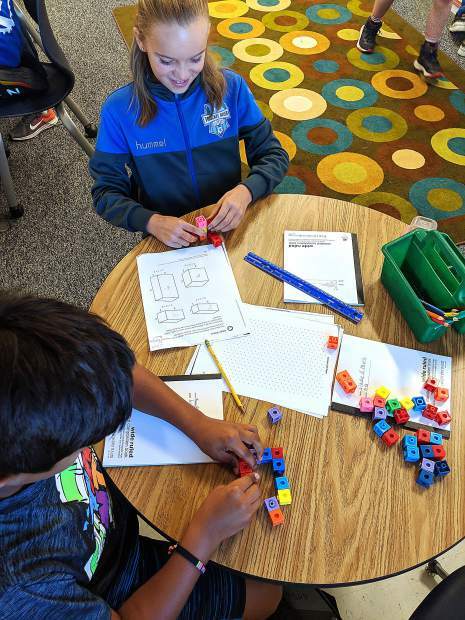 This article was submitted by the Incline Highlander JROTC Battalion.